Each $108 box contains 6 packs. Each pack contains 49 cards. 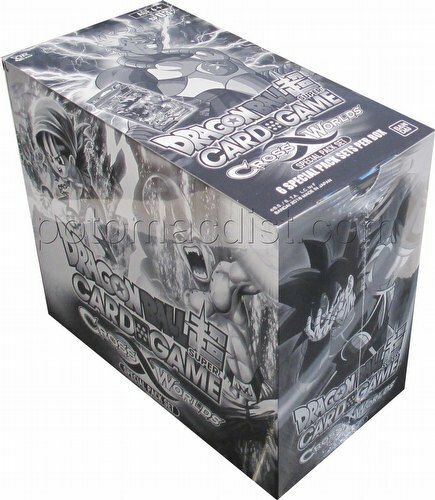 Dragon Ball Super Cross Worlds Special Pack boxes contain 6 Special Packs. 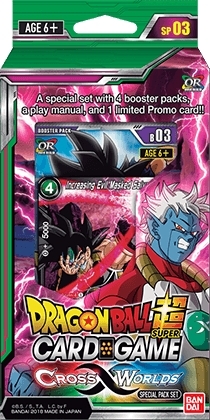 Each Special Pack includes 4 Cross Worlds booster packs, an Increasing Evil Masked Saiyan P-029 PR promo card, and a play sheet. Every booster pack includes 12 cards (8 commons, 3 uncommons, and 1 rare or better).